One of the lessons in the Weight Loss, God's Way program teaches us about setting healthy boundaries. In that lesson, we learn that even though setting boundaries can be hard and they may even hurt us, they will not harm us. I’ve got to admit, I'm struggling with the question of ‘why do things have to be so hard?’ More specifically, why is it so hard to eat healthily? Why is so hard to make time to exercise? Why is it so hard to be nice to some people? Why is it so hard to save money instead of spending it? Why is it so hard to get motivated some days? Why is it so hard to be ‘successful’ in business? And most importantly, why is it so hard to surrender my flesh to God? 1. The ‘easy’ that you want is the exact thing that is making your life ‘hard’. 2. The things that you perceive as hard are what will make your life great. 3. The hard will become easy when you do it, not in your own strength, but in my strength. 4. Doing great things require faith and trust. 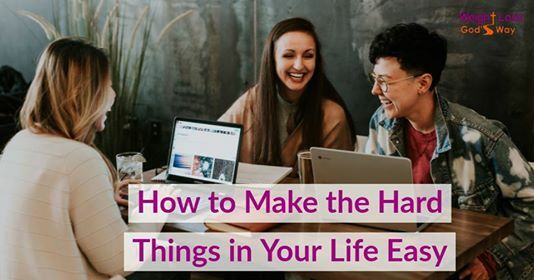 Insight #1: The ‘easy’ that you want is the exact thing that is making your life ‘hard’. "Life is hard because doing the wrong things is easy." The Bible says: “The easy road that you want will only lead to your destruction.” I heard him say. "Enter by the narrow gate. For the gate is wide and the way is easy that leads to destruction, and those who enter by it are many." Matthew 7:13. Insight #2: The things that you perceive as hard are what will make your life great. "Life seems hard because of the perceived fear/pain of work." Insight #3: The hard will become easy when you do it, not in your own strength, but in my strength. High emotional feelings that make us declare changes we desire are not sustainable. If they were, we would have reached our goals already. What once motivated us is now causing us disappointment in ourselves and sets up feelings of failure. This is the reason why we were never ‘designed’ to fight our battles on our own. Trying to lose weight or any other stumbling block on our own is a recipe for failure in the life of a believer. Insight #4: Doing great things require faith and trust. Finally, the Lord lovingly asked me the question, “Will you trust me?” My answer is a resounding yes! And with that, all is well with me again—at least for another week—LOL! I admit that my faith is weak, and so I pray for my faith to be strengthened daily. I know all I need is faith the size of a mustard seed, and every once in a while I can muster up that amount, which is just enough to get me through to the next day. My desire is to do great things for God, so for today, I will not complain about things being too hard. I’m learning that it's not my job to take on what seems impossible; my job is to turn it over to God and allow Him to work in me. I know that whenever I’m struggling with a question or issue, my loving Father is always there to answer it. In my arrogance, I actually thought I would have stumped him with this question—LOL!!! I pray this message blesses you as much as it blessed me.